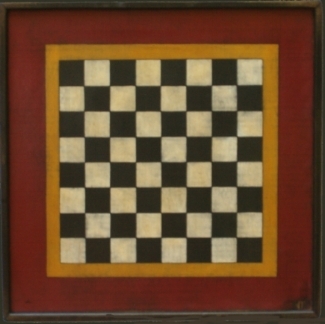 There is something to be said about a single checker board. It often evokes our childhood memories; combining a graphic design of the past and pulling it into our present. 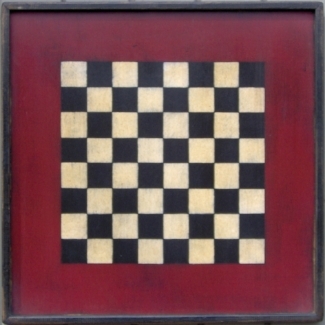 Checker boards are a nice piece that can quiet a grouping of game boards. They give the eye a rest when mixed with other designs. 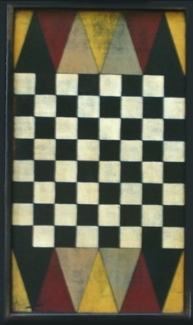 This is often why a grouping of game boards combine the use of a checker board. They also stand nicely on their own, leaning against furniture, walls or placed on a table. This piece….was my favorite challenge of this season. The original piece was dated to the late 1800’s. But that is all of the information that was available to me. It was very difficult to photograph the true colors of this piece - where the red is bright, it’s actually a bit softer. By my eye, since I mixed this shade, it takes on a deep rich and yummy red/deep pink. I’m happy to send you more pictures if you are interested in ordering this piece but are feeling unsure. It was just an impossible color to capture by the camera. But I always say….never give up! The Circus Tent came to mind while painting this piece. The billowiness of the wind pushing movement into the tent. It is my new favorite piece. 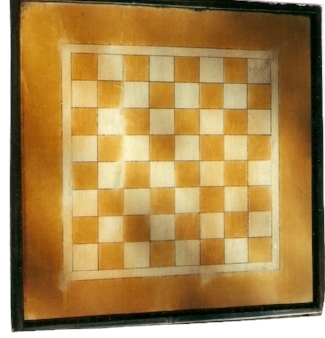 Over-sized Checker Board - Original piece was actual inlaid wood on the ends. I would think the original piece was dated close to 1930’s or the turn of the century. It is a warm and cozy piece that stands well alone or with other pieces. This design is based on a piece from the late 1880's from Canada. I loved the colors on this piece. It reminded me of sunsets growing up on the Gulf. The colors are shades of blue, terracotta, sienna, yellow and gold. Many of the colors are layered so you will see other shades when sanded. 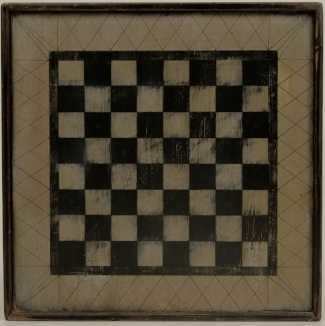 The piece is toned down with waxes so it really is a warm piece. I love hearts.....I honestly wear heart earrings nearly everyday that my friends have made for me....the sentiment of a heart is so sweet to me...and I think they are so timeless to have around us throughout our homes....warm memories... A brighter red was used with a bit of blue and off white. My design is based on a piece from 1934. 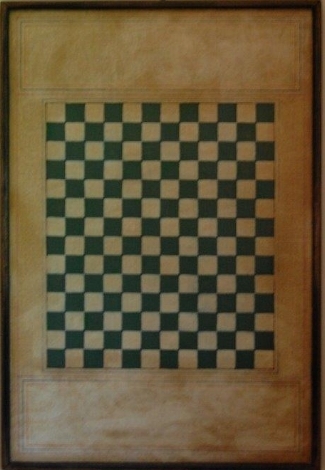 The original was signed 'happy birthday 1934' on the back and painted on laminated board. Selling price was $2,100. Titled 'grace' for I feel His Grace touches us all. Great to mix in or can stand alone, black hold a room down, so to speak. Great to mix in or can stand alone, black holds a room down, so to speak. Painted in any two colors of your choosing. 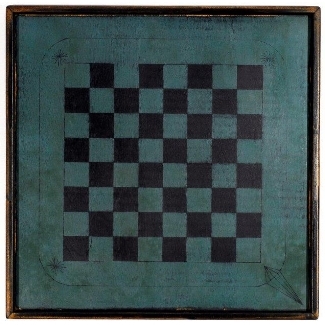 A twist on the joker checker - for all of you 'blue' lovers. Dedicated to my grand Niece, Emma, the dancer. 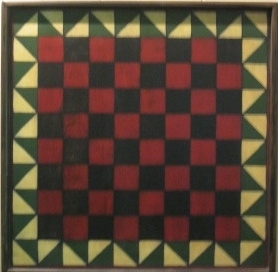 This checker board was based on a piece from Pennsylvania dated 1850-1880. It was signed 'wise', so therefore the name that I chose for this piece. 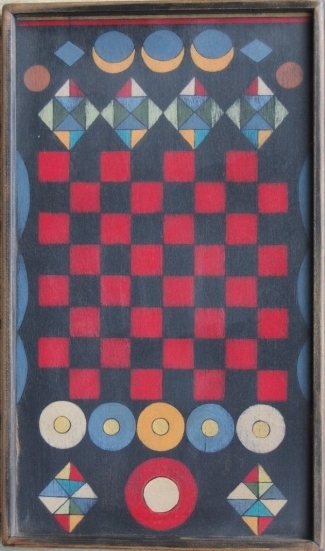 On the reverse side of the original is a painted backgammon design with the Star of David and a wagon wheel...this piece was auctioned for $10,500. light and simple.... perfect for a little girls room too...and works well with the new brighter colors that are popular right now.